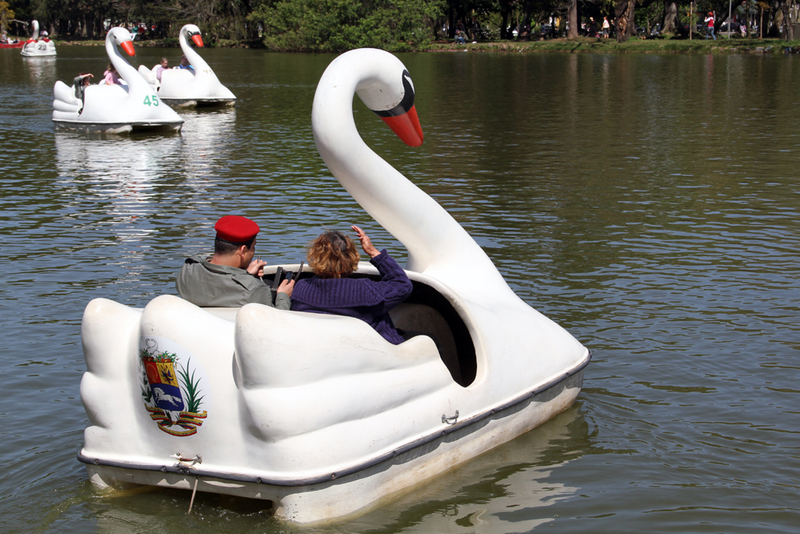 Each Sunday for five weeks, at the lake in Porto Alegre's central park, actors portraying Venezuelan President Hugo Chavez and United States President Barack Obama gave free rides in swan-shaped boats to the public. As they travel with members of the public, the actors asked the question that all lovers eventually ask, "what do you really think of me?" The public's response to this question was recorded live by the presidents themselves. In the afternoon, both presidents delivered speeches taken verbatim from the opinions they have gathered. Both inside and outside their countries, Chavez and Obama have managed to function as uncanny screens onto which all sides of the political spectrum project their fears and ideals. Speaking for the first time as conflicted figures, they tuned public perceptions into first-person personal orations reflecting the complex political conditions inside Brazil as it struggles between the socialist influence of Venezuela and it's growing status as an economic power deeply enmeshed with the United States. People are demanding too much from me, but it has to be this way. As a person, I'm well-liked, but I'm not doing a good job as a president. The United States is in crisis. I represent black power, and people expected that to make a difference. I'm trying to do the best work possible, but the whole world created an icon out of me. There was this thinking about me being black, that I would be the best president because I was black. Americans, as well as Brazilians, are always too silent. You have the power to take me out of office! People should get together to impose themselves, to ask for presidential promises to be fulfilled. I am being manipulated. I was elected with my dreams for the United States that I now can't fulfill. You asked me to end the war. In fact, I'm just keeping the war going. I'm not sure why people voted for me in the United States, but I know that Brazilian people don't like me because of the nuclear weapons that I have. I could release a nuclear bomb on Brazil. It is very significant that I was elected at all. The United States was a very racist country until a few decades ago. 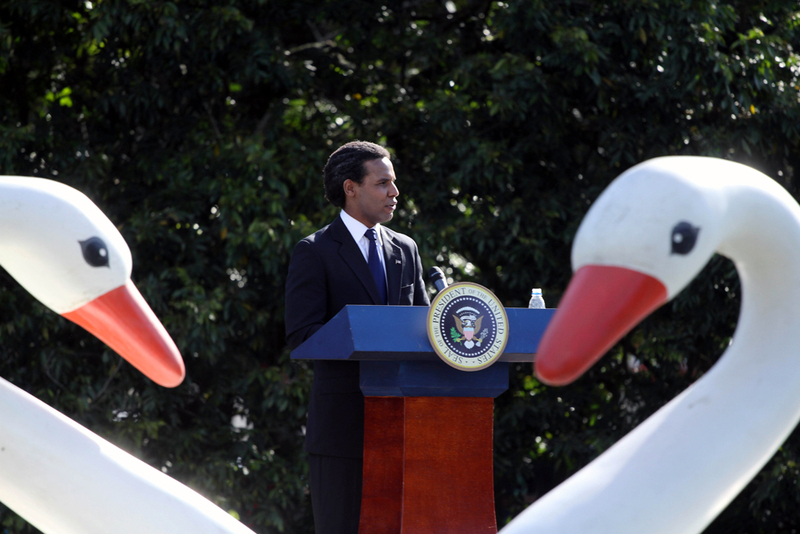 I am the first black president of the United States and one of Arab descent. I think it meant a lot to the American people to see an African American in power. However, it was also the failures of former President Bush that got me elected. But I have my own merits: I killed Osama bin Laden. My citizens wanted to change the war politics, because Bush just wanted war, war and more war. Perhaps I will have my government kidnap or assassinate someone here in Brazil if I don?t think you are democratic enough, like past American presidents attempted with Castro or Gaddafi. But just as people are prejudice against me in the United States, they are prejudice against her here in Brazil because she is a woman and a lesbian. It is very significant that I was elected at all. Brazil recently borrowed money from us, and I just stopped by to ask for a new deadline on that loan. But the Brazilian people themselves are not helped by their own government. Even the PT, 'the party of workers'...HA! workers nothing! Nobody expected that, except my own government who is manipulating me. All of a sudden, I tell you of Bin Laden's death. It's very strange, and sounds a little made up. If you are an ally of the United States, then you can know our secrets, our strategies, our weapons. Lula was our ally. Lula is the man! In this case, there is no personal friendship between us, just a matching of business interests. Dude, I run a developed nation, unlike Brazil. A public heath system works for Brazil because you don't have the financial conditions to pay for private health care. My trip to Brazil: it's good, the two of us together, Dilma and myself, represent two breaks of the power paradigm: me the first black president of the United States and Dilma the first woman president in Brazil. And now everyone knows me. I am the center of the world in fact. You are all indirectly subordinated to me. You are all under me. I am a very contradictory person, I don't trust myself. I suppose that the news can distort my image, making it look worse than in fact it is. That's why sometimes people doubt me. However, if I am eccentric, they should have doubt. I am a little crazy. What's most important is how the people you are serving react. The reaction of my people in Venezuela show who I really am. I am a person with really good intentions, like Fidel Castro, but, you know, every person who achieves power becomes a little disturbed. The Venezuelan people like me, because I am a man who is always fighting for Venezuela and, in this way, am a good president. I have been in power for so much time. This is not a rule imposed on the people, as I am elected again and again by the people. I must be good for the nation. People want to know how long I will stay in power: this is the real question that everybody wants to know, everyone that doesn't approve of me, that is. Actually, nobody approves of me. I am producing something very similar to Cuba's government. The first step you must take to have a real democracy is to preserve the free press, and we don't see it in Venezuela. I am a product of the United States because Venezuela buys American weapons; this is a contradiction. There is a tradition of dictators in Brazil, in your history. I am a dictator. Actually, we must go back to Hitler, if you want to talk about dictators. I'm not bad. I may not be very democratic, but I'm not bad. Just very confused. 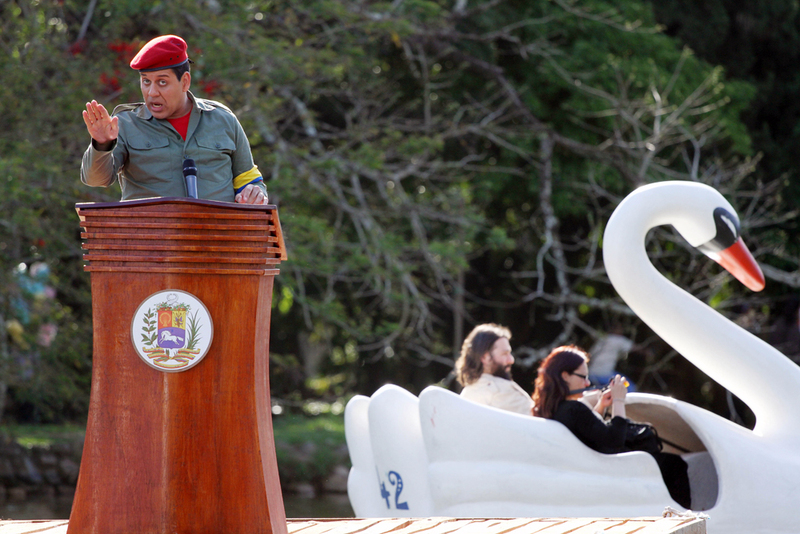 I am a statesman that, for the first time in the history of Venezuela, defends the real interests of the people. I am a comedian, a funny man. I'm very complicated, and I am very controversial. I may be a little lost with what I want for my country, but I am in total command. I can call up a bank right now and take control. 'Hello, I'd like to buy the bank. No problem. Just name the price. But you don't know how to manage the bank. It's no problem, I will buy it, I will buy it. I am a real character. I believe I can "embrace the world with my legs." I have the power, with my army and fighter jets, to bomb anywhere in the world, at anytime. Of course, my main target is the United States. When I wake up in the morning, I could choose any country that I want to bomb, no matter how far away. My government is extremely positive and now is becoming an example for other South America nations. Countries such as Equador, Bolívia and Peru are already following some of my strategies. Everyone who is against me, I merely send them to be eliminated. I take away people who put themselves in my way without any mercy at all, just like the Brazilian army did in the 60's and 70's. Those bodies have never been found, and won't be ever found. In Venezuela, all the media is subordinated to the government now. 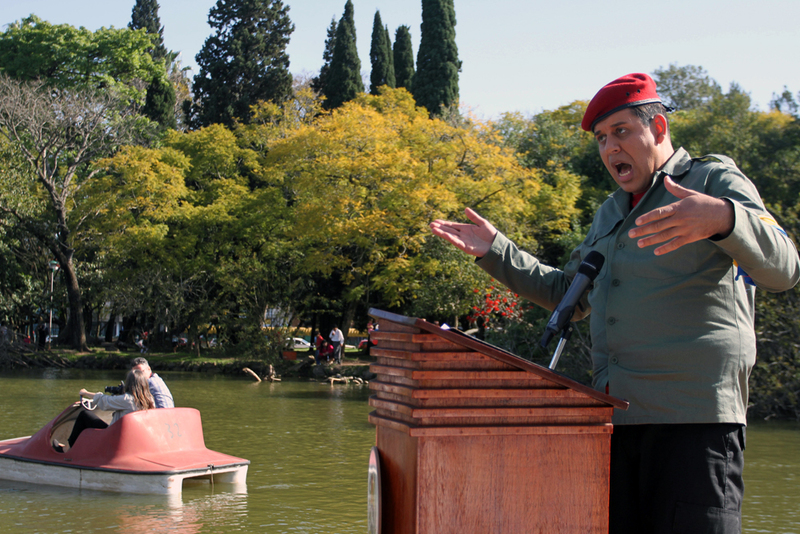 I even have my own TV show, Alo Presidente! Have you seen it? I am a celebrity, some kind of folk character of the people. Lula's government didn't seem to be so different from my own government, but Lula didn't control the media. I think that if Lula had been able the control the media, he would have nationalized some companies also. Special thanks to Paola Santoscoy, Mariana Xavier, Patricia Barbieri, Germana Konrath, Leonardo Valle, the curators and staff at the Fundacao Bienal do Mercosul, Rodrigo Marquez, Rodrigo Shalako, and all of the Porto Alegre residents and visitors that shared their opinions and perceptions of these world leaders.